After running the Jazz Half on Saturday morning, my day was far from complete. 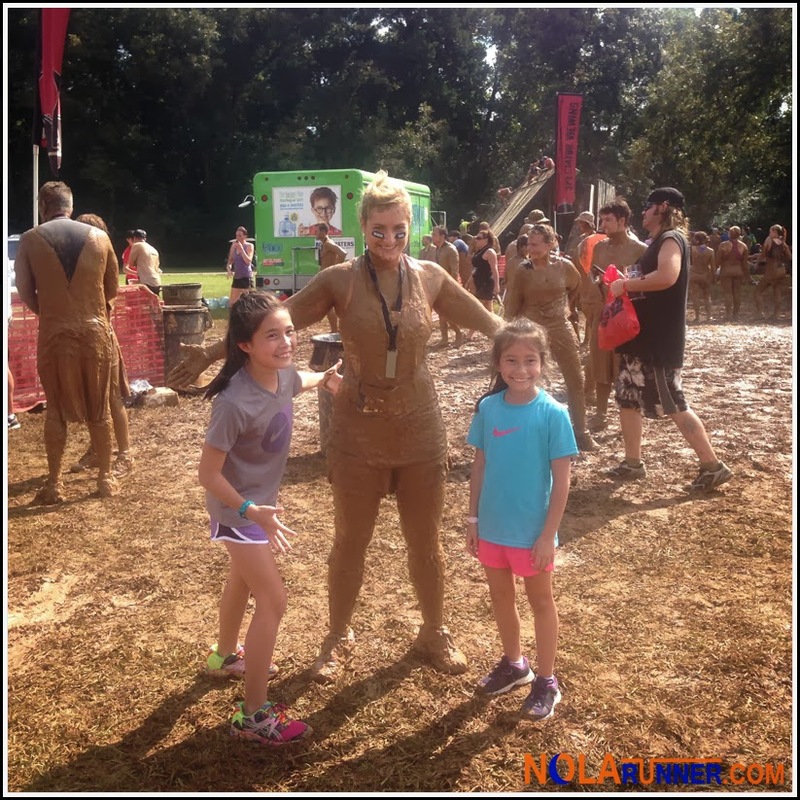 Anne, in all her wisdom, had run the 5K in the morning and decided she would do the Warrior Dash that afternoon. Masochistic with a touch of crazy, that's the type of people I'm friends with. Honestly, I wouldn't have it any other way. Anne's wave to run the gauntlet was scheduled for 1:30pm, and after my Jazz Half took thirty minutes longer than expected, we had little time to waste. 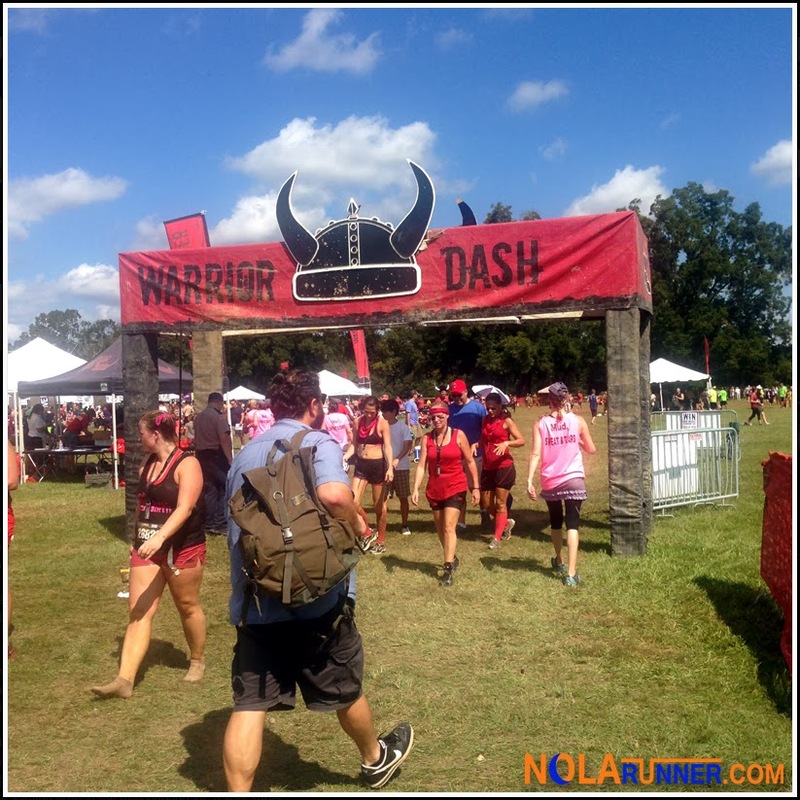 The Warrior Dash people have moved the race around to different locations the past couple years, and for 2013 it was in St. Francisville, LA. Getting through LSU traffic on game day had us nervous about being on time, but my navigation skills and good rapport with Siri helped along the way. I'm not sure of the reasoning behind this decision, but being two hours away from the highest populated city doesn't seem to be a solid business move. However, the festival grounds were packed when we arrived just after 12:30pm and the earlier sold out waves of runners had started to clear out. Anne checked in to get her number, shirt, and hat, and I found the closest shaded spot to steer clear of the mud and sun. The 45 minutes I waited for Anne to run the course was spent watching other competitors climb over a two story wall using their own upper body strength and a rope. 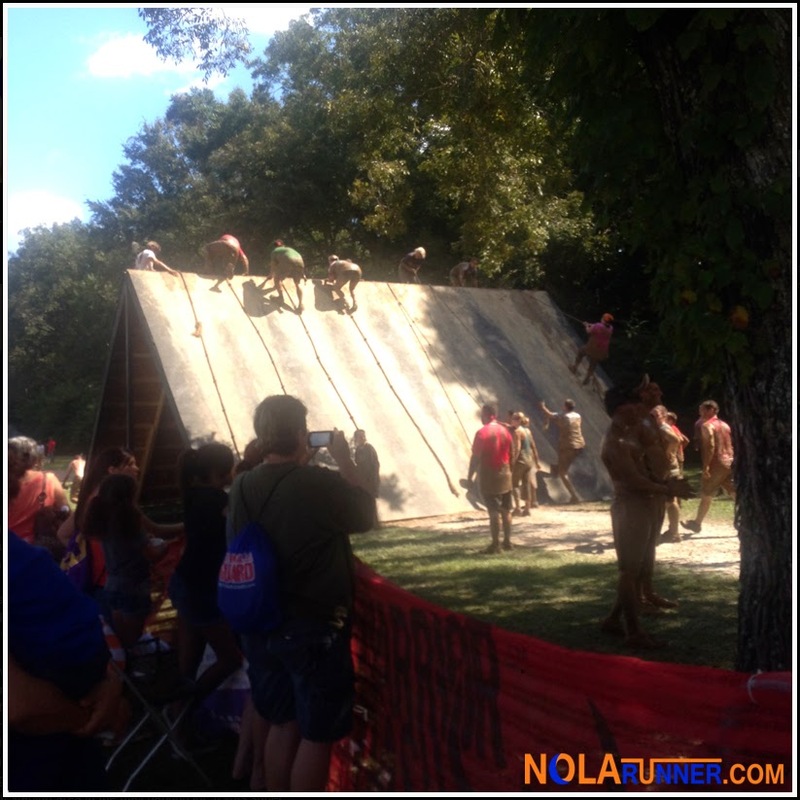 Friends and family had gathered near this obstacle to watch and cheer on competitors. It was really inspiring to see people help each other over the wall, struggle individually to overcome the obstacle, and see spectators cheer for complete strangers as they reached the top. Then Anne came barreling through and climbed that sucker like it belonged on the little kids playground at an elementary school. So much for her needing my words of encouragement. Fortunately, I know my place. I took plenty photos and video for her to watch on the long ride home. The final obstacle was climbing through a mud pit that left everyone covered from head to toe in muck. I'm all for obstacle courses and group challenges. I'm also fine with running for four hours and finishing dripping wet with sweat. I draw the line at orange clay mud covering my body. I know people pay good money to have the same concoction applied in a spa, but I'll stick to an infrequent sports massage or pedicure as my treatment of choice. Anne, however, was all smiles as she crossed the line. At least I think those white things we could see poking out through the mud were teeth. Her family had also driven up from NOLA to cheer her on, so after a few photos to prove that she survived, she took a dip in the warrior bath to get ready for the drive home. We were both exhausted after our long day of running and racing. 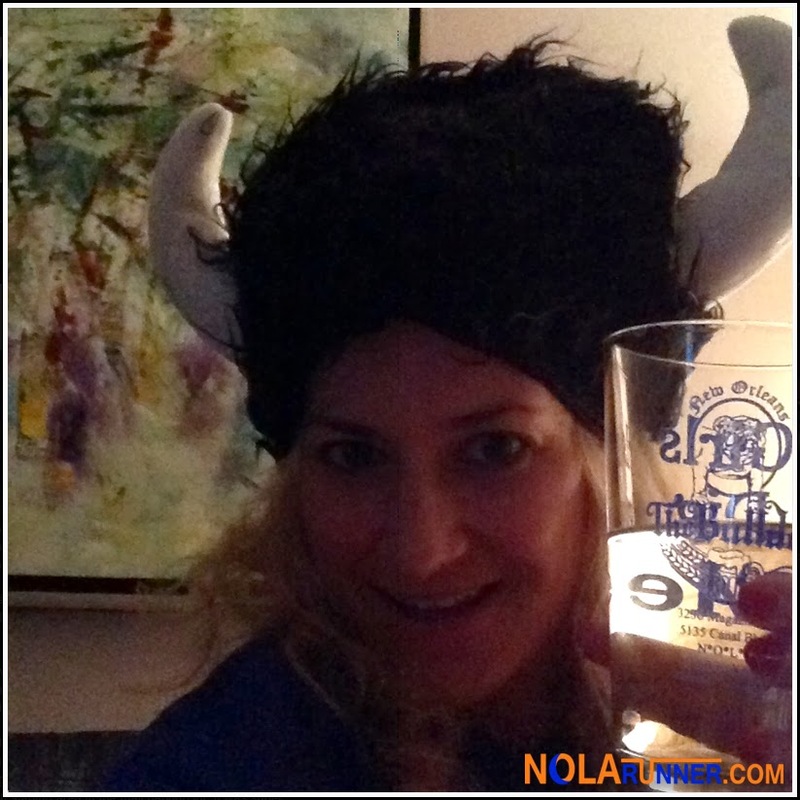 I received a photo text several hours after we parted ways where she had wine in hand and furry hat on top of her head. I totally expected to receive that one at some point in the evening, but knew judgment couldn't be passed. She had totally earned that reward. We'll be back at it again this weekend with Anne doing the Spartan Sprint on Saturday morning, and me doing the Gulf Coast Half Marathon on Sunday. We've even thought about doing the Oktoberfest 5K Saturday night, but the jury is still out on that event. The weather should be great, so I'm looking forward to having a case of déjà vu. Check out this video of Anne taking charge of the wall climbing obstacle. Know that if you meet her in a dark alley, you should probably run in the other direction. You will do it one day Fred! I am sure Anne and myself could coax you into a dash or perhaps a Tough Mudder? Sadly, you two know my weaknesses too well. If you wanted me to do one of these races with you bad enough, you'd know what buttons to hit. It probably involves a really good dinner afterward.